The video is of Marissa Diescher, pitcher for Livingston Manor, a Gatorade Player of the Year with a full-ride scholarship to Penn State. Her fastball can clock at 67 mph, which she mixes with a change up, rise and drop. After taking a semi-finals game 16-0 earlier today against a pitcher who threw 15 to 20 mph slower, Notre Dame Coach Rick Mancuso said his Fighting Irish team was a little out of rhythm to start the game. He also he made a mistake in the first inning, calling the wrong pitch, which led to a home run for Livingston Manor and a 2-0 deficit. It was all up hill from there, with Notre Dame only getting two base runners on no hits and dropping the final 8-0. "It was a great trip and I couldn't be prouder of the girls," Mancuso said. "We had a great time down here. It was awesome." He said even in being no hit, the Notre Dame girls were pleased to get a chance to compete against a player of Diescher's caliber. The Notre Dame girls softball team won its semi-final championship game in Glens Falls today by a score of 16-0. The team will begin a game within the hour to decide the state champion in its class. The Notre Dame girls softball team has a chance to play for the state championship this saturday and students and faculty gathered in the school's gym this morning to give the girls a rousing send-off. The team plays in a state championship semi-finals game at 11:30 a.m. in Glens Falls on Saturday. If they win that game, they'll play in the finals at 4:30 p.m. The team is coached by Rick Mancuso. posted by Brittany Baker in Oakfield, Alabama, softball, Oakfield Alabama. It might have been a rainy day and a ball field with more mud and puddles than grass and clay, but I can say with certainty that the first ever Oakfield Alabama Alumni Softball Game was a success -- I was there. Yep, I proudly put on my blue and gold colors and --- although my cleats have been misplaced over the years -- my good old softball glove to play against the other 25 or so OA grads who bravely turned out for the rainy game. While us “even graduation years” ended up beating the “odds,” everyone had fun stepping up to the plate one more time. I already can’t wait for next year! Varsity baseball coach and organizer of the event, James Patric said he hopes for next year’s turnout to be better so a tournament can be arranged with more than two teams. “We’re looking to improve from here, I’ve asked all the players what they’d like to see done differently and now that we have the first game to learn from, I’m hoping for a bigger crowd,” Patric said. Retired OA athletic director Fred Francis agreed. “What a great start we had, but you can tell everyone in the area that didn’t make it for some reason or other that I’d better see them on the field next year,” he said. So as a personal challenge to all of those who couldn’t make it (especially the ones who still live in the area -- you know who you are) why not make next year the first of many alumni games to come? Hornet Pride Runs Deep… so prove it! posted by Brittany Baker in sports, Oakfield, Alabama, softball, Oakfield-Alabama High School. As a softball team alumna of Oakfield-Alabama High School, I can say with certainty that I'm quite excited to get a chance to play on the same fields I ran around on "back in the day." But, I'm not the only one who's ready to relive my time as a high school athlete. Registration forms for the tournament are starting to come in, according to James Patric, currently a physical education teacher and baseball coach at O-A. "More and more people are calling about the game and details so I hope we have a good turnout," he said. Patric hopes more enthusiastic alumni turn in their registration forms so the tournament can be a "real hit" in its first year.The deadline to turn in the forms and money has been extended to Wednesday, May 4, just in case some more people decide to join in the fun. In an attempt to gauge interest in an activity like this, a Facebook event page was put together asking Oakfield graduates to pass the link around. About 50 positive responses poured in so planning began and a date was set for the first Oakfield-Alabama Alumni Softball/Baseball Tournament. It will take place at the softball/baseball fields at the school from 11 a.m. to 5 p.m. on May 14. Registration costs $40 and will include a chicken barbeque dinner, a T-shirt to commemorate the day, Gatorade during the game and a chance to "hit the one you missed" or just to enjoy the sport with some old comrades. "It should be a really fun day for everyone involved," Patric said. Since it's likely the reunited teammates might want to mingle after the games, an adult reception is scheduled at the Caryville Inn on Main Street in the Village of Oakfield. For more information or for last minute registration, contact James Patric at 716-560-3438 or e-mail him at [email protected]. 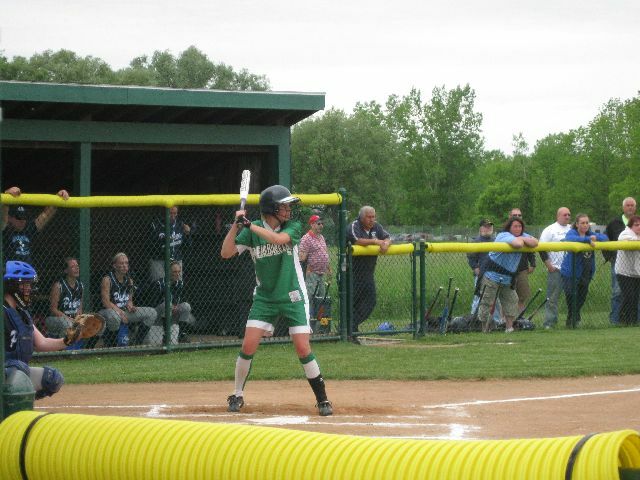 posted by Destin Danser in sports, pembroke, softball. The Pembroke Lady Dragons JV softball team defeated the visiting Kendall Eagles 8-6 tonight in a fairly close game. Julia Baker went the distance on the mound for the Dragons striking out 9 batters, and allowing 4 hits and 7 walks. Baker also went 2 for 4 at bat. Ashlee Gilchrist went 2 for 3 with a double, and Breanna Johnson went 3 for 4, also getting a double. Kellie Mroz went 2 for 3 with a clutch 2 run single in the 6th inning to help secure the win. Kayla Streit and Randi DellaPenta also had hits. Both teams played a great game!! Submitted by Mary Beth Mcmartin. posted by Brian Hillabush in baseball, basketball, football, sports, volleyball, hockey, softball. The Buffalo News today reported a story in which reporter Maki Becker gives us some more detail on the New York State Public High School Athletic Association cuts as he interviewed executive director Nina Van Erk. There wasn't a whole lot of information than what we have previously reported, but there are a couple of interesting items in the piece. Van Erk says that it is expected that the cuts will save schools in the state up to $10 million, with nearly $6 million of that going to officiating fees. The other thing that comes from this story is that the cuts are expected to be for two years. The changes, which were approved by a slim majority late last month, would begin in the next school year and would remain in effect for two years, Van Erk told the paper. This opens up some more questions. Did Van Erk and the rest of the NYSPHSAA directors make these cuts for two years because it is a quick fix to help schools and families get through these difficult economic times? Was it announced that the cuts are for two years because that is the original plan or because of all the backlash the NYSPHSAA has received from coaches and athletic directors? And what happens after two years? Will these policies just continue or will they be reviewed again at that time, with the number of games being returned to the schedule? Buffalo Public Schools athletic director David Thomas summed up what a lot of people are thinking when they hear this with his quote late in the story. “I don’t think we should be worried about funding school budgets on the backs of the kids playing sports,” said Thomas told the paper. posted by Brian Hillabush in batavia, baseball, football, sports, soccer, softball. Batavia High School has been one of the smallest schools in the Monroe County League for a long time. It has hindered the chances some programs have had to win. But those things are about to change as realignment has given Batavia a chance to remain part of a league, yet be competitive in sports it normally struggled to compete in. "With our school and our size, Monroe County recognized that our school and Greece Odyssey were a little different," Batavia athletic director Mike Bromley said. "You have to give them credit for that because they give us a league affiliation and will allow us to be competitive." The Blue Devils will be playing in Monroe County League Division III, but will be essentially playing a half-league schedule. Geography is a big consideration for Monroe County as teams were realigned. Division I and II teams are matched up as much by travel distance as school size. Division III is mostly about size. Batavia will play each team in Division III once in both boys and girls basketball, boys and girls soccer, baseball, softball and volleyball. That means the Blue Devils will get to play seven league games, which is also happening with Odyssey. While Batavia will no longer be eligible for league championships, it will give teams chances to schedule non-league games with teams that they can compete with. A prime example is the boys soccer team, which experimented with the schedule least year. Batavia went 7-10, going 7-1 outside of Monroe County and 0-8 in the league. "We gave up the opportunity to win a league championship because we don't play everybody twice," Bromley said. "But to be able to go out and get schools that are closer to our size and be more competitive makes more sense than trying to win league titles." Kids will still have a chance to be recognized as all-county and there will be no changes for track & field or cross country. This sets up some potential great local rivalries, especially as Batavia drops down to Class B. Imagine home and home series' with Attica or Albion. Those could be great local rivalries for Batavia. Once you get past not being able to compete for a league championship, there are still goals for Batavia teams. There will also be changes in the modified programs at Batavia, as the drop in numbers will no longer support a seventh and eighth grade team. The two grades will be combined for modified and will play a schedule based on geography. Division I: Canandaigua, Irondequoit, Fairport, Penfield, Rush-Henrietta, Webster Schroeder, Webster Thomas. Division II: Brockport, Churchville-Chili, Gates Chili, Greece Arcadia, Greece Athena, Greece Olympia, Hilton, Spencerport. Division III: Batavia, Brighton, Greece Odyssey, East Irondequoit Eastridge, Honeoye Falls-Lima, Pittsford Mendon, Pittsford Sutherland, Victor.